As artists, we often put our art before our financial safety. Some people even wear that strategy as a badge of honor. I’m here to to tell you that you’re hurting yourself in many, many ways if you don’t get financially safe. One of the ways you can start to shore up your financial walls is to save money. And until now, there were very few ways to do that automatically that worked. I found one. Everyone from your grandmother to your tax preparer tells you to save money. And it’s like pouring salt on a wound if you tell that to someone who’s in financial danger. Whether you’re struggling with money, or you’re doing just fine, I found a way to automatically sock away a money here and there, with almost no pain at all. It’s called Digit, and it’s a service that takes into account how much money you have coming in, and how much you have going out. And then, it carefully, without stressing your financial situation, takes a bit here and there and saves it for you. Note that I said automatically. You link Digit to your checking account, and it becomes your savings account. But it doesn’t just grab the same amount of money on a regular basis, something you’ve probably tried and abandoned. Digit’s much smarter than that. 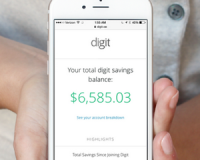 Digit takes into account each user’s unique financial situation for the day. It learns things like pay days, rent, recurring bills, spending patterns, and average balance to determine how often to save and how much to safely set aside. Most folks see 2-3 savings transfers per week on average. The average savings transfer is $18 but is typically between $5-$30. However the minimum Digit will ever save is $0.05 and the maximum is $150 (extremely rare). I signed up for it, and watched as the savings varied from a few dollars to $98 on a day when I got paid a few thousand dollars for narrating an audiobook. It really was painless, and I love how easy it was to sign up. 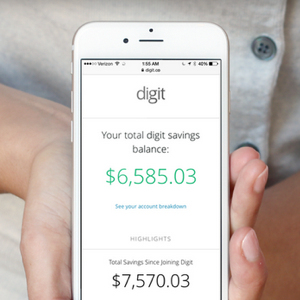 Digit works with most major banks, and you need a smartphone to use the app to watch your savings grow. The end result is what’s important. You save for disaster, and you save so you can recover from those disasters. You also save for the day when you’re unable or unwilling to continue doing what you’re doing. Some people call that retirement. Starting a savings plan now can really be useful, in ways you can’t begin to predict. Being able to set the throttle on this savings engine, and let the Digit autopilot take over, knowing that when you can save more you will, and when you can’t, well, you won’t, is comforting. Even if you’re really strapped, you can breathe a little easier, knowing that by using Digit, you’re helping yourself be financially safe. I’ll continue to share strategies and tactics over the next few weeks about how to be financially safe. And if you have anything in particular that you find stressful or confusing about financial safety, let me know in the comments below. Dave, this really is an awesome application. Just signed up. I only wish I had a following like you to get the boatloads of referral credits! That’s a true win-win right there. Just had to mention, however, if you are fortunate enough to have a Wells Fargo Bank in your neighborhood, they have automatic savings tied to their checking accounts. Every time you swipe a debit card, $1.00 of your checking account balance gets moved over into your savings account. We’ve been doing that now for over 18 months and don’t miss the funds, because they get moved automatically to a safe place, your own savings account. There may be other banks that do that too, but Wells Fargo is the only one I know of at the moment. Bummer… My bank’s not in their network. I’ve said it before and I’ll say it again. David Lawrence is a GENIUS! Thanks for another great tip. Signing up now. I’ve got one blog, http://mymoneyblog.com that I’ve followed for years about finances. Most broker-speak quickly goes over my head, but this is great for laymen. It points to all kinds of financial offers for savings, checking, investments with consistently up to the minute offers. Last year for instance, I saw a free offer on it for CreditSesame, so I’ve got a free credit score tracker for a year. In the past, I’ve transferred balances to get no interest on credit card debt for 6 months, so I could save up the money and pay it off immediately before the interest free time expired. It remains the best resource for best credit card offers in 4 categories: travel points, cash back, lowest interest, best balance transfer offers. (example: You can find out which credit cards offer 50K or more miles toward an airline you want to use for an upcoming trip.) Ya never spend what you wouldn’t spend anyway, but why not pay all your bills or make that unusually high purchase pay off in another way.